Our hero, Gizmo Sprocket, races for dear life as a trio of furious humans gives chase, calling him “thief” and opening fire. Gizmo piles into his sentient spaceship, Soto, and after antagonizing the “fleshies” one final time, takes off for the safety of outer space. Soto, aware things at the casino didn’t go over so hot, chastises Gizmo for losing. While stroking a fat stack of cash, Gizmo insists that the blackjack computer was rigged and he merely “fixed” it. *This story was created as a 3-page comic, but was published in Domino Chance #7 on a single page, with each original comic page tilted horizontally and stacked one on top of the other. *Domino Chance #7 also featured the main title “Domino Chance” story by Kevin Lenagh and a 2-page back-up story, “Life at Top Volume” by Larry Becker and Fugate. So here we have the very first Gizmo story, or at least the first one that I know about. It appears as though it was a last minute addition to Domino Chance #7, kind of shoved into the book in the most awkward manner possible. I can’t tell if it was originally intended to be a “mini comic” or just a 3-page short, though the way the text is so shrunken and hard to read I get the feeling it wasn’t meant to be published at such a squat size. There’s also absolutely no promotion for or mention of the comic on the credits page or in the editorial (though Larry Becker’s back-up gets lots of buzz). Thankfully, Michael Dooney’s art doesn’t suffer much from the presentation. Each page consists of no more than 3 or 4 panels, so the art is big and easy to follow, even if the text might be a strain on the far-sighted. Gizmo has some magazines in a pouch on the inside of Soto’s door I get a feeling were supposed to be “Easter egg” jokes, but the text is so small I can’t read the titles. I love Dooney’s design work for Gizmo and Soto in this series. Gizmo is a fairly generic, featureless humanoid robot, yet Dooney adds so much life and personality to the character through his facial expressions, body language and clothing. The “classic car” design for Soto is especially cool, moreso on the interior than the exterior, in my opinion. There’s so much detail in there, from the buttons on door lining to the leather seats, to the window crank and door latch. My mom owned a beat-up 1964 Impala SS (four door), and the interior was so similar to Soto’s that every time I see it I smell that car. But getting back to Gizmo Sprocket, his first appearance here paints an interesting interpretation of the character that doesn’t really hold steady as his narrative progresses. Here, he’s introduced as a swindler or a con artist or an otherwise likable scoundrel, whereas later appearances tone him down to a more kind-hearted Joe, albeit one who always has a scheme up his sleeve and a wisecrack on his tongue. 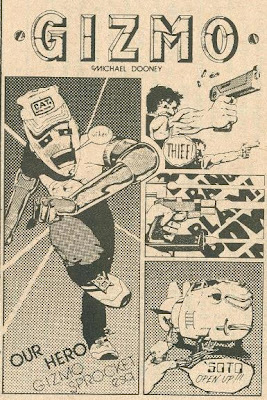 The “outlaw” angle will continue through his next appearance, “Shopping Spree”, as he’s hunted down by a police inspector, but will all but vanish by the time the Gizmo ongoing series rolls around. 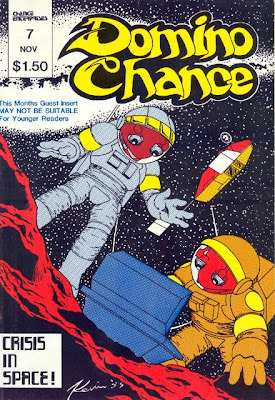 I often wonder if this comic was ever published any place else before Domino Chance #7? If it was, I’d certainly like to scoop up a copy so I can read the story in better quality. As it stands, the “shrinking and stacking” doesn’t damage the contents too harshly. For an introduction, it paints Gizmo in a far different light than his subsequent adventures, but Dooney’s art and attention to detail still leaves “Our Hero” with its own attractive qualities. I found a near-complete run of Domino Chance in the dollar bin at my local comic shop, and chances are you’ll find them there, too. So if you’re a Gizmo fan I’d definitely say it’s worth it to see if you can hunt this issue down, as copies go for plenty cheap. I'd never even heard of this book before! I'll keep an eye-out for these issues in the dime-to-dollar bins I frequent! Michael and I had been corresponding for a couple of months when this little Gizmo story showed up. Sandra asked if we could print it and Michael said yes. It IS the first Gizmo story. Gizmo would show up on the margins of Michaels letters (yes, handwritten letters) and he evolved from there.